We can now supply and/ or fit the tried and tested Lite Steer power steering conversions for your VW. With versions available for splitscreen, bay window and T25/ T3 vans/ campers off the shelf in both Left and Right hand drive formats we can cater for your needs. The Electronic Power Assisted Steering (EPAS) system is speed sensitive, so in effect when most needed at low speeds and whilst parking or manoeuvring. Full details of the systems can be found at LiteSteer's website but if you have any queries or questions please do not hesitate to contact us. Its been a while since the last post, so apologies. So much has been going on, that the updates may have to come in stages. A while back, you may have seen Craig's car arrive. A whole heap of work after its 5 year lay up, including a rear disc brake conversion, axle swap, replacement clutch kit and a lot of work making the Beetle T1 narrowed beam setup work well in the Type 3 with a front disc and Porsche brake conversion, saw a fresh MOT, and a new look. Craig had set his sights on taking his T34 Razor edge Karmann Ghia straight out the doors to the Viva Skeg Vegas show in Skegness. A few late nights in the workshop, a thorough detail by our good friend Paul at The Detailing House, and a last minute fitting of the handbrake cables that we had custom made, collected en route from Wales by Craig, meant that at around 7.30pm on a friday night, we finally waved goodbye to the razor. The smile on Craig's face made it all worthwhile, and the next day he set off for a trip from Surrey to Skegness, where the car won a trophy (in the shape of a custom wine rack full of wine) and then Craig set off on his way home to Wales. We were really happy to hear that the 400 mile test drive went without a hitch and the trophy was icing on the cake. It didnt stop there either, Craig drove the Ghia to the RSVP bbq (a club renowned for its superb slammed and narrowed rides) where it collected another trophy for "Raddest Ride". 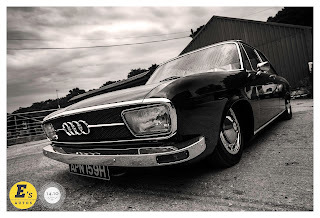 Then followed a superb feature in Ultra VW magazine, even gracing the centre spread, shot by Rothfink, and a feature in AirMonkeys magazine. More importantly Craig has been racking up some miles, enjoying having the car back and driving it as much as possible. Seems like business is on the up, and all the cars are going down. Most of the cars through the workshop recently have been lowered in some way, and others have arrived with the intention of getting them lowered. 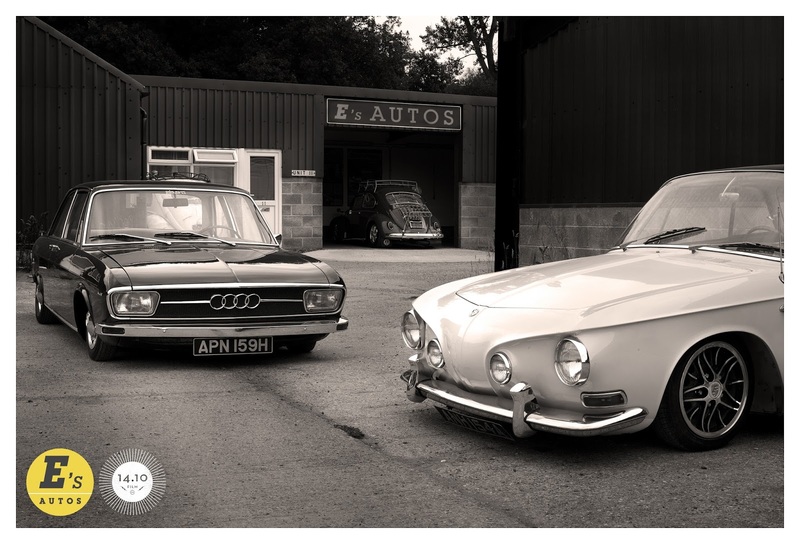 While all the kit was setup, PJ asked if he could shoot some photos of the cars we had in the workshop, and the results are stunning, we think you'll agree. Click the photos to enlarge. E's Autos recently had the pleasure of working on this nice original 1974 VW Type 2 Campervan. Recently resprayed in the original "Leuchtorange", and with a really good original Westfalia "plaid" interior that sleeps 4, and seats 5 (or 6 including the buddy seat). Benefitting from an 1800cc twin carb engine, and servo assisted brakes, this is a very user friendly VW to drive. The camper spent many years in Canada, with lots of paperwork and service history to show how well it was looked after there. The interior features three VW lap belts in the three seater rear bench, a cool box, sink and water tank, and a small gas cooker. There's also a nice period styled sun canopy, some retro flasks/ coolers, and some owners manuals to go with it. £12995 o.n.o. 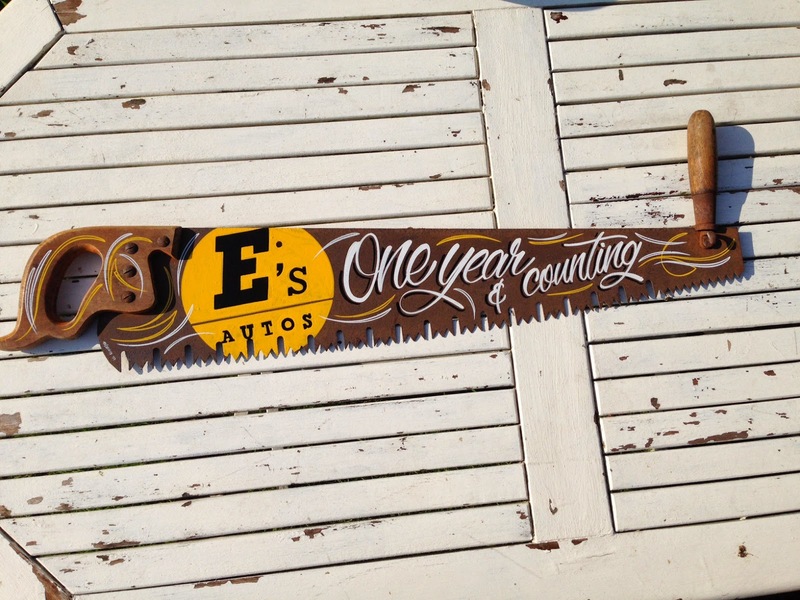 For all enquiries please contact E's Autos and we'll put you in touch with the owner. This years summer seemed to be a long time coming but now seems to be in full swing, and the workshop has been busy preparing cars to be enjoyed whilst the sun shines. If there's one car that thrives in the summer sun, its a Beach Buggy. Nev's Bugle buggy project is really coming along now, and E's Autos whizzed across Surrey and Hampshire and seperated the body and shortened VW Beetle floorpan to enable the floor to be rolled out from the garage, painted, detailed and prepared for the body to be dropped back in place once it has been painted. Dan came over in his beautiful Oak green Mk 2 Golf Gti 16v to show just how noisy the stainless exhaust system is, and to discuss alternatives. A stock OEM system may well be the way forward here. Terry's daughter realised just in time that the MOT on her VW 1303 was due, so paid us a visit for a few jobs and tweaks, a new MOT and a project plan for the future. A customer enquiry about rewires, and vehicle electrics led to a chat with Neil, who wanted the piece of mind that a leisure battery and auxiliary wiring system could offer for family camping trips in his 2 litre, 1978 Baywindow Westy (IE- the family could run everything all weekend and still drive off at the end of the holiday). A complete new system was fitted with extra 12 volt sockets, a seperate easily accessible fusebox and space for additions as and when required. Thanks to Neil and his E's Autos Flyer distribution (thanks Neil) at the Volksworld Camper and Bus cruise/ show from Guildford to Bournemouth, yet another Westfalia Baywindow camper found its way to the unit for a thorough engine checkover. Dave's 1970 VW T2, now benefits from a leisure battery system, a mains hook up and a working fuel gauge which should mean that the whole family are kept happy on those camping holidays near and far. There's also a few other projects bubbling away under the radar but the owners are shy. We also had a very interesting visit from the owner of the "Humbersaurus'. Google "Humber Hot Rod Burnout" for this highly modified Humber, with around 650bhp. Long summer days with actual real sunshine in them, meant that plenty of cars appeared out of hiding and headed towards the workshop in order to make the most of it. PJ's Pearl White 1965 VW Splitscreen Westfalia came by for a full service and a CSP disc brake conversion prior to a trip across Europe to European Bug In 5. PJ decided whilst we were at it, he fancied changing the wheels to chromed and detailed Fuchs replicas. The results were a pretty impressive stance and a much improved drive. He also popped in, in his beautiful Beryl green 1963 Beetle running an Aire Valley beam and air ride system that we fitted earlier this year. Vic and Jude's Bahama Blue 1965 VW Beetle had been suffering from use as a slammed daily driver on the pothole ridden streets around Brighton and Hove, so in it came for a full running gear service, brake check and a pair of fresh shock absorbers at the rear. A chance wrong turn earlier in the year led to meeting a friendly bodyshop owner with a couple of cool US import Type 2 VWs. The early bay had a few gear selection issues which were diagnosed and rectified before the camper went off to live with its proud new keepers in Basingstoke. Being in the car scene for so many years, we have made a lot of good friends and contacts. 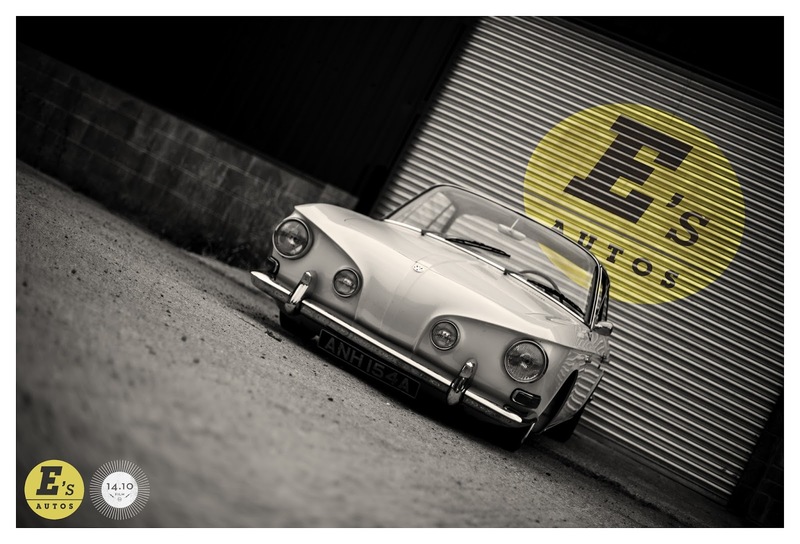 One of those, Craig owns a very good example of a Razor edge Karmann Ghia that had stalled as a project. With a day spent catching up over spanner swinging, we had it rolling and ready to recover to the workshop with the help of our tame recovery truck drivers.